AlBariq AlAkhdar / The GREEN CONCERT is a high-tech /civic concert happening at the heart of Riyadh city, with an exceptional backdrop overlooking the Financial city. The show, performed by Jean Michel Jarre along with 2 guest musicians, is a combination of live composed-mixed music altogether with a magnificent light, laser and GFX show. 2018 would be a bit short notice, I guess. Yes I still don't have confirmation whether it's 2018 or later. [Edit] The concert in Riyadh was signed 13 days ago, but will really be this year. It is a command of the Emir of that country. ah, so it'll probably will an Electronica tour concert? The GREEN CONCERT is a high-tech /civic concert happening at the heart of Riyadh city, with an exceptional backdrop overlooking the Financial city. 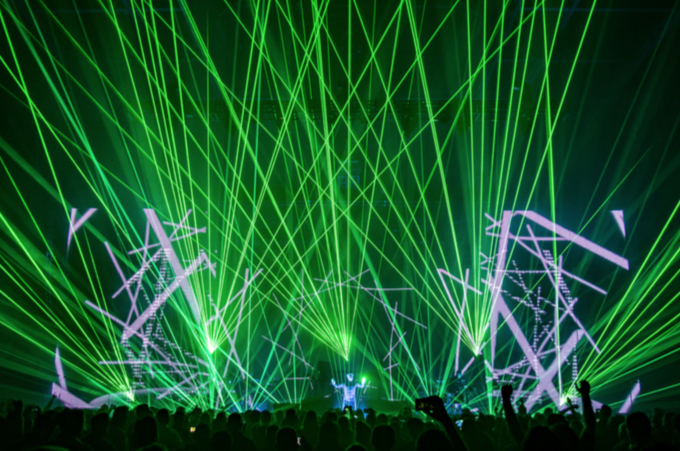 The show, performed by Jean Michel Jarre along with 2 guest musicians, is a combination of live composed-mixed music altogether with a magnificent light, laser and GFX show. It is an exceptional occasion that represents the generosity of the homeland, where we offer the highest degree of artistic creativity. “King Abdullah Financial Center” in Riyadh, the architectural masterpiece located in the north of the thriving city, was chosen as the venue for a global show by the pioneer of electronic music - Jean Michel Jarre - to share his wonderful music with the Saudi audience through a dynamic and visual panorama. Organized by the General Entertainment Authority, the show which has already been held in more than one country will be attended by millions of people using visual techniques, architectural lights, and light effects that will illuminate the entire concert for an hour and 45 minutes. Jerome Gueguen will replace Stephane this time! On the occasion of the 88th Saudi National Day, which falls on the 23rd of September 2018, the General Entertainment Authority will be hosting a spectacular cultural performance in Riyadh. The Green Concert event is conceived by legendary French electronic musician Jean-Michel Jarre. Jarre, as customary, is to enhance his live stage performance with his signature dazzling world-class 3D visuals and architectural lighting. The event is free and open to all Saudi public. Ambassador for Environment and Education. Jarre sold more than 80 million albums worldwide, and is renowned for his groundbreaking concerts performed at historical landmarks across the world. Without any doubt it will be an HISTORIC MOMENT! Does anyone confirm the broadcast? As someone living in Saudia Arabia, this is incredible news! But jeez, some notice would've been nice. I'm desperately trying to book flights and hotels now.